In January 1973, dockworkers in Durban embarked on a wave of wildcat strikes against low wages. In total, some 61 000 workers took part. What became known as the “Durban Moment” not only broke the industrial relations framework that had been established after black trade unions had been smashed by the apartheid state in the 50s and 60s, but also led to the rebirth of the black trade union movement, which saw the establishment of the Congress of South African Trade Unions (Cosatu) in 1985. A similar moment took place on August 17 2012, the day after 34 workers were shot and killed at Marikana in the North West. Workers, rather than ending the strike after the massacre, continued their attempt to secure a new wage of R12 500. They were soon joined by tens of thousands other workers from across the platinum belt. The strike lasted another 90 days. Cosatu’s biggest affiliate at the time, the Nation Union of Mineworkers (NUM), leaked tens of thousands of members as it failed to support workers’ demands. In many cases, it sided with management against striking workers. This led to a third moment, which took place between December 17 and 20 2013, as Cosatu’s largest affiliate – and the largest union in African history – the National Union of Metalworkers of South Africa (Numsa), held a special national congress to decide on the future of its relationship with the trade union federation and its alliance partners, the African National Congress (ANC) and South African Communist Party (SACP). At the end of the congress, Numsa decided it would formally break away from the tripartite alliance after being in it for more than 20 years. It set its sights on expanding its scope to other sectors, including the mining industry, and declared open war against the faction led by Cosatu president Sdumo Dlamini, which is dominating the union’s leadership. Most significantly, it began the process of building a left political alternative to the tripartite alliance. The key moment of the Numsa congress didn’t take place in some back room meeting of its elite or in the commissions that debated and decided on Numsa’s resolutions; it took place on the first night of the conference when Rehad Desai’s documentary on Marikana, Miners Shot Down, was screened to more than 1 000 delegates, guests and journalists. The proceedings of the next day began when delegates marched into the venue clutching R100 rand notes singing, “Who killed Mambush at Marikana? Zuma must resign. Phiyega must resign. Ramaphosa must resign”. Why is Numsa splitting from the tripartite alliance? These reasons are pretty straightforward: Despite numerous attempts, Cosatu has been unable to influence the policy direction of the ANC since 1994 and has consistently moved in a neoliberal direction, first through the adoption of the Growth, Employment and Redistribution programme (Gear) in 1996 and now more recently with the adoption of the National Development Plan (NDP). As Numsa general secretary Irvin Jim admitted at the congress, “the strategy of swelling the ranks of the SACP and ANC has failed”. The ANC remains, as its leaders like to point, out a “multi-class formation”, but the unions and left-leaning sections of the alliance are becoming increasingly politically marginal and the SACP has transformed into a reactionary clique that uses Stalinist jargon to defend the president at all costs. Or, as Jim put it: “We want a vanguard party, not Blade’s fish and chips,” in reference to SACP secretary-general Blade Nzimande’s single-minded determination to liquidate whatever the SACP once stood for into unconditional defense of President Jacob Zuma. The last attempt to force the ANC left was at Polokwane, in which the alliance’s left made a Faustian pact with Zuma, his shady backers and various disparates to come into power and break with “the ’96 class project” and remove its representative in chief, former president Thabo Mbeki. But this, ultimately, would prove fatal for the left. Their mistake was twofold: Firstly, in thinking that they could call the shots and control Zuma, and secondly in individualising the political struggle within the alliance through the figure of Mbeki. The supposed leftward turn of the ANC after Polokwane never came, and the much-vaunted “Lula moment” proved to be phantasmagoric. The working class has been rewarded for bringing Zuma to power with e-tolls, the youth wage subsidy, the NDP and, of course, Marikana. Following this, it declared: “Numsa calls on Cosatu to break from the alliance. The time for looking for an alternative has arrived.” Numsa sees part of its mission to attempt to fulfill that leadership vacuum both in terms of the “leaderless” working class and in terms of the left in South Africa more broadly. It seeks this in the face of the disintegration of the alliance’s left, the continued irrelevance of much of the molecular independent left and the collapse of social movements in the past five years or so. The media expected Numsa to announce it would form a mass workers party with immediate effect to compete in the 2014 elections or announce its merger with the Economic Freedom Fighters (EFF) or something along those lines. But the trade union chose to pursue a strategy of building a united front with left-leaning elements of civil society, other unions and community organisations before it moves towards the stage of building a party. There have been suggestions that Numsa and the EFF are natural allies, but both Numsa membership and leadership were highly critical of the EFF during the conference. It was asserted that the EFF was anti-capitalist rather than being socialist, meaning that it was not committed to workers’ control as a principle of economic transformation. Furthermore, Numsa regards EFF leaders as undemocratic and is highly suspicious of Malema and his cohorts’ previous history “as capitalists”. All of this is clearly outlined in the report given at the congress by Jim. What type of party Numsa would evolve into is still very much an open-ended question. It could be a broad mass workers party or it could be another vanguard party. But, like the “Durban Moment” in 1973, this Numsa moment marks a new direction in the trajectory of the workers movement in South Africa. Hello Benjamine, just read your article. In a way I show solidarity with anyone who strikes or creates a little hovoc because of low salaries and wages, because the fat cats at the top are getting so much fatter at the expence of the common worker. Perhaps you may want to take a good look at the conditions and ultra low wages the poor farm workers earn in the Cape Winelands, these poor people are basically slave labour, but that’s just my opinion. In fact the low wage issue is across the board and in a lot of instances black, coloured and white wage earners are paid less than the minimum wage, is absolutely shocking, but what can these poor people do, they need their jobs. The past year has seen a sharp escalation of class tensions in the country, as violent confrontations have broken out between workers, who have launched repeated and sustained wildcat strikes, and the state security forces (cops/ army) backed by the unions (NUM/COSATU) and the African National Congress (ANC) with the complicity of the mine-owners and their investors *. In the mining sector alone, more than 60 have been killed during the past year, 2013, as a result of such clashes, including the massacre of 34 South African miners and many injured, by security forces during the platinum Marikana miners’ strike of August 2012. The massacre of workers was supported by the ANC and the COSATU trade union federation, including the NUM. Workers @ the mine shafts and underground have rejected NUM/COSATU as an openly “yellow union” which is allied to the capitalist mine-owners and the ANC-State! 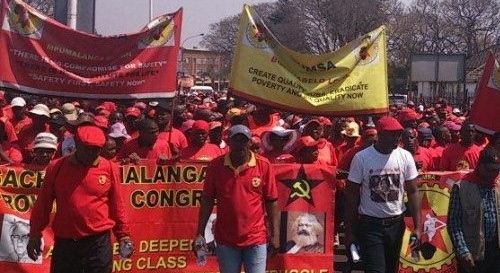 The intensification of the class struggle in South Africa is being fuelled by savage attacks on the working class by the mining companies, which are seeking to cut costs through mass sackings. Anglo American Platinum (AngloPlats) is seeking to push through 3,300 layoffs and has threatened to shut down a number of its operations in South Africa, saying they are no longer profitable (sic!). South Africa’s registered unions are collaborating with the employers to dissipate opposition and contain the struggles that are emerging in the working class. The unions hope the strikes will let off steam, while keeping workers’ struggles from developing into a political conflict with the ANC government, especially in an election year. Joseph Mathunjwa, president of the AMCU, which has presented itself as a more “radical” union, openly acknowledges that the unions are seeking to generate more favourable conditions for negotiations with the companies. “A strike is not what we are after, we are being pushed into a corner,” he complained. The shop-stewards @ LonMin and AngloPlats have now rejected BOTH the Num and AMCU! The end of the gold miners’ strike recently, is yet another betrayal of the South African working class by the trade unions, in this case the National Union of Mineworkers (NUM) and the Associated Mineworkers and Construction Union (AMCU). As with every previous strike, the NUM has sought to pack-in the strike as quickly as possible, while posing as a defender of workers’ interests. For its part, the AMCU instructed its members to continue working throughout the gold miners’ strike. AMCU-dominated AngloGold and Harmony mines continued to operate. Such actions show the real orientation of the “militant” AMCU, which is hostile to the working class and fears that even limited strike actions could develop momentum and move beyond the control of the unions. The direct impetus for the strike last year was the breakdown of wage negotiations. South Africa’s Chamber of Mines, which represents the collective interests of the mining companies, initially offered the gold miners a 6.5 percent wage increase. Rejecting this meager offer, which is only 0.2 percentage points above the rate of inflation. Major gold producers, including Sibanye, AngloGold Ashanti, Gold Fields, Harmony Gold, saw production impacted by the strike. The miners’ strike came amidst major actions in other industrial sectors, including a strike by 90,000 construction workers and 30,000 auto manufacturing workers. Reports have also emerged of power station employees shutting off power switches in protest. The circumstances exist for a powerful united struggle of the entire South African working class, which the unions, in collaboration with the ANC-State, are determined to avoid. From the beginning, the NUM expressed a desire to come to terms with the companies and the State, while playing the “race card” to divert attention from the class issues at stake.